Last month the first offshore wind turbine using the Slip Joint Connection was successfully installed at Eneco’s Princess Amalia Wind Park off the coast of IJmuiden, the Netherlands. I congratulate the partners of the SJOR-consortium and the GROW program with this success and important milestone. A DOT wind turbine (also a TKI Wind op Zee supported project) was successfully installed on a monopile using a Slip Joint Connection. 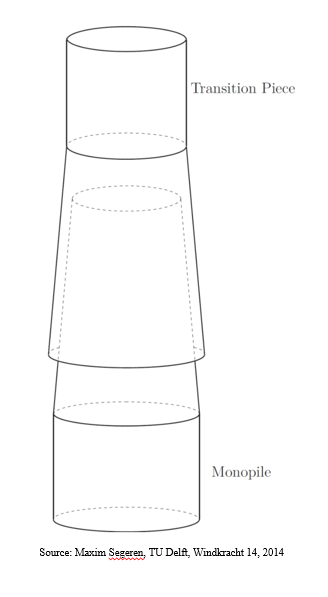 The Slip Joint is an alternative connection between an offshore wind turbine and its foundation. Installation is done by simply sliding the wind turbine over the monopile without the use of grout or bolts. This simple mechanism allows for cost reduction and a shorter installation time. It is the first time a Slip Joint Connection is deployed offshore. The wind turbine will stay offshore for a year to test and collect data regarding this innovative connection after which the gathered data will be processed and used for validating lab tests by both TU Delft and TNO. For more information please refer to the GROW website. This project shows the importance of offshore demonstration of innovations. The TKI Wind op Zee is working on the availability of future test- and demonstration sites, both onshore and offshore. For more information about demonstration, please contact us! Application open for the Innovation Awards 2018! In order to inspire, inform and offer networking opportunities for the new generation, the Young Professional Hub can be found at Offshore Energy Exhibition & Conference (OEEC), taking place on the 23rd and 24th of October in RAI Amsterdam. The Hub is a physical place and meeting point on the exhibition floor in Hall 2, specially designed for young professionals from the industry. Last year, the community of Offshore Wind Innovators awarded ECE Offshore and Jules Dock as the most appealing offshore wind innovations of 2017. This contest will return this autumn again! The Award (selected by a jury and a business audience) is a recognition of the Dutch innovative power of this young, dynamic and booming sector. Innovative start-ups and SME’s can apply for the Award till the 5th of November. On September 28th, 2018 the Minister of Economic Affairs and Climate Policy has informed the Dutch Parliament about the tender procedure for the offshore wind farm zone Hollandse Kust (zuid) Sites III and IV. Part of this procedure is a draft of the Ministerial Order for permitting offshore wind energy HKZWFS III and IV. The Netherlands Enterprise Agency hereby provides you an English translation of the draft version. This draft version shows that for this tender market parties may submit an application for the realisation of the wind farm without subsidies. In the event this tender procedure fails to yield an acceptable bid, a tender procedure including subsidies will be initiated. Report and other deliverables of the geophysical survey have been published. Hollandse Kust (noord) geophysical survey and its appendices can be downloaded here. A hard disk drive containing all geophysical deliverables can be ordered with this order form. The first 15 months of metocean campaign data acquired at HKN can be downloaded here. In an open innovation project a step towards realisation of multi-use concepts is made by conceptualizing, building and testing a concept, including model tests in the basin. This way, experience is gained on multi-use of offshore space and open innovation. Valuable data can be measured on the interaction between floating solar panels, seaweed farms and wind turbines whilst setting an inspiring precedent for the industry. The first step of the open innovation is the concept development. This has been done in a design sprint with experts from different backgrounds. The conclusion of the design sprint is a modular lay-out with bioinspired flexible solar panels and a seaweed growth system which can be easily harvested and seeded. Of course the hydromechanical aspects are not the only important research topic. During the tests next steps in the development of multi-use platforms will be shown to interested stakeholders. To kick off Maritime Week, MARIN is opening their doors in Wageningen to everyone on Saturday, 10 November, from 9.30 to 17.00. You are very welcome to visit MARIN at Haagsteeg 2, Wageningen. If you could borrow a group of talented mathematicians for a week, what would you have them do? The Study Group Mathematics (SWI) with Industry is a combined industrial-academic workshop where mathematics is used to tackle problems presented by companies and other organizations outside academia. Roughly sixty mathematicians, both from industry and academia, gather during the week to collaborate intensively on industrial problems. The format follows the original Oxford model, dating back to 1968, which is used worldwide in similar study groups. Six companies each present their problem on Monday. The participants devote the entire week to solving these problems in smaller groups. During the week groups maintain contact with the problem owner to ensure that their efforts stay targeted at the problems posed by the companies. All groups present their work on Friday morning. In the 2018 edition, CBS, CQM, DNV GL, Hobaho, SciSports and SKF participated. The popular proceedings and scientific proceedings from previous editions can be found here. Participating in the SWI leads to new insights for the company or confirmation of company insights by experts. The week also allows companies to become acquainted with students and evaluate them for future employment. The 2019 edition of the study group is organized by Wageningen University. It will be held from January 28 to February 1. Companies that wish to pose a problem are invited to contact the organizing committee. More information can be found here. In September a Dutch offshore wind campaign started. This campaign gives a good overview of the Dutch sector and Bob Meijer was interviewed on his opinion on why innovation is critical to offshore wind energy. Find the article here. Find out more about the campaign. Workshop Offshore Wind Farm Zones Hollandse Kust: 23 October 2018, Amsterdam, The Netherlands. Find out more. Information Session tender Hollandse Kust (zuid) Sites III and IV:15 November 2018. The Netherlands Enterprise Agency will organise an information meeting. In this meeting the Netherlands Enterprise Agency provides you an update on the Ministerial Order for permitting Offshore Wind Energy 2018, the subsidy and permit, the application forms and model for operational calculation. The presentations will be in Dutch only. Please register by email at @email. Please take a look at more wind energy events here.